Ultra-Athlete, Pete Kostelnick, aims to set new record for running across America. He is running 70 miles a day for 44 consecutive days to also get people excited about active lifestyle, running, and to support charitable causes via Adventure for Charity. “It’s a very pure sport. Anyone can do it. It transcends into personal well being." Pete Kostelnick, financial analyst by day and superhuman runner, often by night, has a cross-country trip planned next month. Unlike the ordinary traveler, however, he won’t be using a plane or a car, a train or a bus. He’ll be running from San Francisco to New York City, covering the entire 3,100 miles on foot. To set the new world record for this feat, he plans to run 70 miles a day for 44 consecutive days. It’s already been a record-shattering year for the 28-year-old Kostelnick. 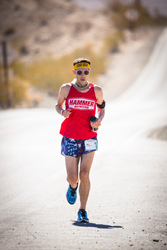 In July, he set a course record for the STYR Labs Badwater 135, an ultramarathon promoted as “the world’s toughest foot race”. Three years ago, he ran beside cyclists in Iowa’s RABGRAI event, a seven-day crossing of the state. He became the first runner ever to complete the 423-mile course. Tanner says that Kostelnick’s RAGBRAI run was “a physical achievement barely comprehensible to the average ultra athlete.” Several sponsors have taken notice of the notable record attempt and have stepped forward with shoes, nutrition, products and services. They include HOKA ONE ONE, Anywhere.run, ultraDOC, Nathan Performance Gear, Squirrel’s Nut Butter and deFUNKIt. speed—improves health and physical fitness for almost everyone. Kostelnick and his support team plan to begin his record-attempting run on the steps of San Francisco City Hall on September 12 and arrive at City Hall in New York City in 44 days…or less! Pete Kostelnick was born and raised in Boone, Iowa and graduated from Iowa State University with degrees in Finance and International Business. He is married to Nicole Kostelnick, also a runner, and lives in Lincoln, Nebraska where he works as a financial analyst for National Research Corporation. He is a widely respected ultra-athlete with a growing community of sponsors and supporters. For more information, visit http://www.petesfeetaa.com. And follow Pete on social media at #petesfeetaa. For Pete’s Feet Across America, runners anywhere in America can sign up to participate in 3-day/2-night running excursions on segments of the 3,100-mile route or raise funds independently and then direct that money towards an organization selected by Kostelnick: The 100 Mile Club fights childhood inactivity and obesity by empowering kids “to achieve a healthy lifestyle through physical activity.” Students are encouraged to run or walk 100 miles at school during a single school year. For more information, visit http://www.100mileclub.com.